One of the major themes of “Red Rose” seems to be the idea of acceptance, the idea that sometimes, you just want it all to be over. Given Kurt Sutter’s penchant for writing in sustained and unnecessary suffering–Juice, anyone? Otto?–at this point in the series, it’s all just so exhausting. This has been one of the major problems of the series, but it also fits in well with the themes surrounding the penultimate episode. Here, everyone is simply ready, accepting, and perhaps even welcoming, desiring the release that comes with death, finally free of the suffering endured. These deaths, therefore, serve as anticlimaxes in a series that usually pairs violence with cathartic release. When the blade or the bullet enters the body here, what results is not justice or satisfaction or revenge; it is pain and exhaustion, the death seemingly just inevitable, something that was bound to occur no matter what. As a result, we could even argue that Juice and Gemma died while in control of their lives, encouraging the other person to kill them rather than letting death come to them. In fact, if Jax truly wanted to destroy Gemma, he wouldn’t have killed her, therefore leaving her to wallow in misery in that garden. By taking the shot, we see just how past the point of no return he is, just how finished he is with this life. Sadly, he also takes Unser down on the way. Unser has been anything but a good character for a while now, but he has always represented loyalty and friendship and true love. He always stuck by Gemma, and his final line is fitting: “This is all I have.” Then, because he is in the way, he takes a bullet in the chest from someone he has known for a long time. He is the ultimate victim in this unrelenting cycle of violence. 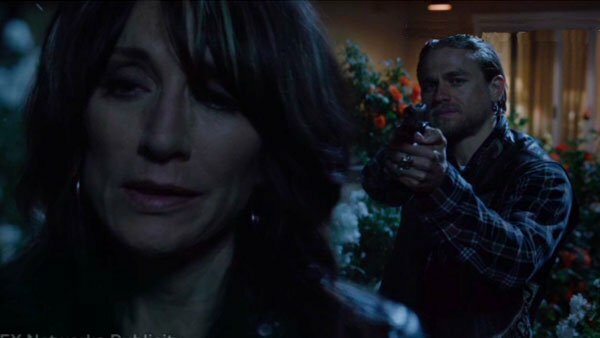 As Jax Teller stands in the garden, pointing a gun at his mother’s head, we see a man who is long past saving. He can’t help but hesitate, but as we already know, Gemma has come to terms with her fate. She has left behind her bags, visited her dad, and admitted her wrongdoings, and she is ready. Jax shoots. His shoes are stained for the first time, stained with his mother’s blood. Gemma now lies among the roses in the garden, and her son is nothing but a shell of his former self. -The first 50 minutes of this episode is a slog to get through. I get that the show likes to show us the various deals being put into place, but the fact that we’re spending this much time on this kind of stuff right now is just inane. -So, Wendy looks to be a Tara replacement here, and we’re coming full circle. Knowing Sutter, I predict that Jax, Wendy, and Abel will get out untouched, but then they’ll get hit by a truck, fall off a bridge, show a few bare asses, and get shot 50 times each. -Looks like Vic Mackey got fed up with his day job and decided to become a trucker. It’s always nice to see Michael Chiklis in any show, and here he is as Milo, the trucker Gemma comes across at the rest stop (she also sees the homeless girl again). -Speaking of cameos, there’s Charisma Carpenter (Buffy) as the receptionist at the nursing home, and there’s Hal Holbrook as Gemma’s dad. Also, Robert Patrick shows up again. -The unwritten bylaw Jax wants taken down is most likely the one prohibiting black members. -Well, Nero and Unser, that’s what you get for not calling the cops. Anyway, I’m looking forward to the conclusion of his storyline next week, as Jimmy Smits will most likely do a fabulous job with it. -Unser died as he lived: useless. -The montage at the end is set to Ed Sheeran’s cover of Foy Vance’s “Make It Rain”. I expect there to be a 150-minute montage next week to close out the series. As long as it isn’t a Katey Sagal cover…I’ve jinxed it, haven’t I? -One more episode next week. Part of me hopes Sutter can deliver a good ending, while the other part of me hopes he goes crazy and reaches a new level of awfulness. I’ll be covering “Papa’s Goods” right here, next Tuesday, December 9th. Predictions? Share below. So..as a HUGE #SOA fan since day one.. I gotta say..there was nothing in this episode that surprised me and that made it sort of a drag. After last weeks truly great eps. this was lackluster and as you point out..if Jax wanted to REALLY hurt Gemma..he would have let her live..PLUS it would have been unexpected as again, everything about this eps was predictable and not in a good, exciting way. Sadly, it’s been a very uneven final season starting off odd with adding more questions instead of wrapping the old ones up, then they upped the ante quite a bit for about the last 3 eps. then this was a let down for me. Not the shows best season by far. Ah well..let’s hope for the best in the finale next week. Yup, completely agree. Last week’s episode was far and away their best episode in a while, but this week’s did feel a little like it was just checking all the necessary boxes needed for the finale. I still think the best season was season 2. The show has fallen quite a bit from the quality of that season (which was truly stellar TV). Season 2 was pretty fantastic, but my favorite season has always been season 4, yes even with the horrendous Deus ex Machina ending. Season 6 is still the shows low point for me. My god season 6 was just awful. And then If the finale is good, then this seasons admittedly somewhat strong final act will also push it over season 3. Yeah, this would’ve been a great, say, 5 season show. That would’ve reined Sutter in a bit, which is something that has to happen (or else he may ruin a show). Its always a gamble with SoA. Throughout its run it’s been a mixed bag of results, funny thing is everybody’s opinion on what’s good and what’s not is different. Personally I think season three the weakest but others think it the greatest. This episode was kind of the same. It was a bit all over the place until the triple-kill took place, but then I thought Unser’s death was unnecessary, and I wasn’t satisfied with Gemma’s end. After what she’d done throughout the series she deserved so much more than a simple bullet. For mine the Jax-Gemma confrontation would have been the best way to end the show, but now that it’s come and gone it feels like the finale will just tie up the loose ends. Nevertheless I’ll tune in, as I always do. Season three probably had one of the weakest storylines–the Ireland one–but one of the best finales. I liked episode 11 a lot, but this one kind of fell flat. I’m happy Gemma died though because my greatest fear was that Sutter was going to let her get out of this show alive which would be horrendous. I didn’t think he would, but given how far the show has fallen it didn’t seem impossible. I think Jax will die in the finale though I’m not sure how. While the show has been kind of a mess for a few years I am kind of excited to see how it ends. If nothing else as a big TV fan, it is fascinating to see a show come to a close. It is a tough thing to do for even great shows and at the very least should be interesting even if it flops.